Ultra Culture mourns the death of Patrick Swayze. 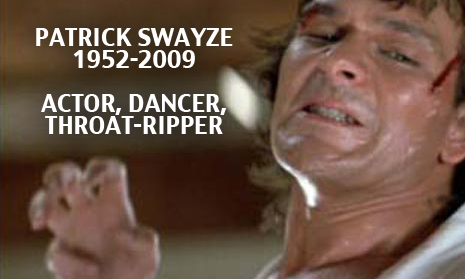 Though he was not the best actor of his generation, iconic roles in movies such as Ghost, Dirty Dancing, Point Break, Road House and The Outsiders ensured that The Swaze can never and will never be forgotten. Here we take a look at two of his greatest creations: sickening self-help guru Jim Cunningham in Donnie Darko (see from about 0:51 in the first video) and throat-ripping super-bouncer James Dalton in Road House.